The typical sliding glass door is not very secure. If you've locked yourself out of your home, it's a good option for re-entry. The "lock" consists of a thin bracket on the frame, with an L-shaped hook on the door. It's easy to defeat with a screwdriver or pry bar. The good news is that if you break it, it's easy to replace. Depending on your door's configuration, it might be better to focus on the stationary panel instead of the slider. The narrower the door, the easier it is to pry open. 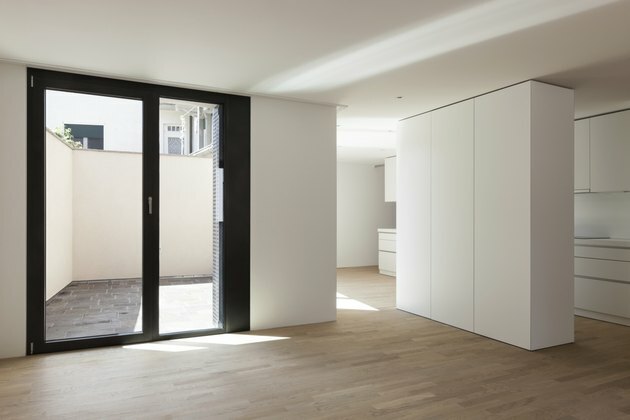 Sliding doors are manufactured with two different styles: the slider on the outside, or on the inside, of the fixed panel. The outside slider is the usual candidate for prying. The inside slider is difficult -- if not impossible -- to pry open from the outside. If you prize security and have a choice, choose an inside slider for this reason alone. The bracket -- referred to as a striker on standard doors -- or catch on the frame is nothing more than a hole or brace. The L-shaped latch on the door connects with the bracket, typically pivoting up from the bottom to lock the door. Insert a screwdriver or pry bar between the door frame and the door about 6 inches from the corner, diagonal from the latch, at the bottom and pry upward. Tilting the door lowers the latch, releasing it from the bracket. If the L-shaped latch has an downward pivot -- as opposed to the upward pivot -- it won't release the same way. It may take more prying force to bend or pivot the latch or bracket far enough to release it. It will likely result in the replacement of the latch and possibly the bracket, but the door will be open. Wiggle the door, if it's stubborn, to release the latch and bracket. Inside-mounted sliding doors require a different technique. The corner of the slider is inside the home, and there's no way to pry it. Focus on the stationary panel to get the door open. Check at the top and bottom where the stationary panel terminates in the tracks at the top and bottom corners. Locate screws, brackets or bumpers that secure the panel, and remove them with a screwdriver. Stationary panels typically slide in the track, just like the slider. Grasp the panel with both hands and slide it to gain entry. If it won't budge, it may need to be pried and lifted. Grasp it with both hands and lift up. The top of the panel should disappear into the top track, as the bottom lifts out of the bottom track. When the bottom of the panel clears the frame, tilt the bottom of the door toward your feet, out of the track and down to remove it. If that doesn't work, you may need more lifting force. Insert a screwdriver between the track and the bottom of the panel and pry up to lift the door out of the track. Jammed doors can be resolved by prying in some instances. Older, aluminum tracks wear out. When the door jumps off the worn track, a screwdriver placed between the track and the bottom of the door can be used to lift the door back onto the track. Older aluminum tracks typically can't be replaced when they wear out unless you replace the entire frame, but a replacement cap can be installed to keep the door from jamming again. Newer door tracks collect dirt, hair and debris around the rollers, or the rollers wear out. Fix the problem by turning two screws counterclockwise to lower the door. The screws are on the inside of the door, on both sides at the bottom. Remove brackets at the top as needed, and then tilt the door toward your feet and remove it from the track. Check the integrity of the rollers and replace or clean them as needed to get the door moving again. Prevent tampering issues by inserting a wooden stick between the track and the top of the stationary panel, to prevent the panel from being lifted. Another trick is to place a stick or broom handle in the bottom track on the inside. It's effective but won't prevent the door from being lifted to gain access. 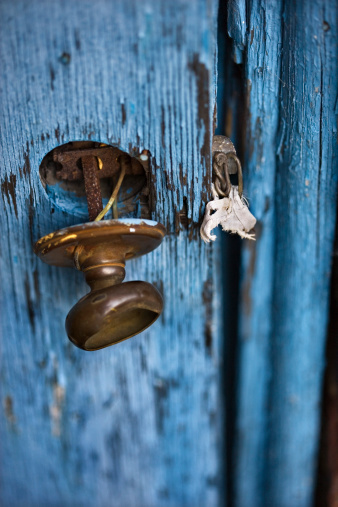 A mortise cylinder lock, just like an ordinary door, will prevent lifting and prying. You'll need to drill into the frame to install it. Anti-theft locks are another option. They fit on the inside, and are typically easier to install. They prevent the door from moving with a deadbolt that moves up and down. If a thief is determined to get through the door, however, breaking the glass is always an option. Deter thieves by installing anti-theft film on the glass. It slows down penetration with sharp objects and is sometimes enough to discourage them.